Deals Seeker: What is LivingSocial Plus And What Are Deal Bucks? What is LivingSocial Plus And What Are Deal Bucks? I am ALWAYS looking for amazing deals. What better way than to get "deals on deals"? which is a NYC Boat Tour, the cost of the Harbor Pass for One Adult is $14 and a child is $7. As I am looking for things to do this summer in the NY/NJ area for my triplets, I thought this would be perfect for them. When I took the triplets to London, all they wanted to do was ride on the boat that went up and down the Thames River. So when I came across this deal, I thought it was perfect! But lo and behold, what did I notice next? That LivingSocial has something called LivingSocial Plus, which is essentially a "deal on a deal". 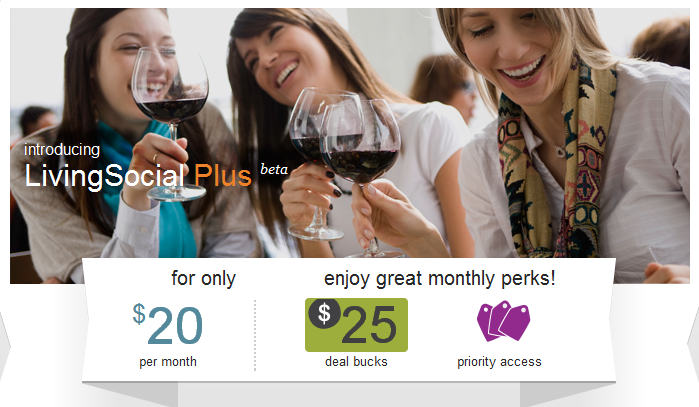 You pay $20 per month and get $25 Deal Bucks! Deal Bucks are LivingSocial's currency. The kicker is, is that you never lose your money, because if you don't use the $25 Deal Bucks, you get to rollover the money you invested ($20) to the next month. You can cancel anytime and you get to keep your Deal Bucks, which are good for 5 years. "Deal Bucks work just like cash for any eligible LivingSocial purchase (may not be used on Takeout & Delivery, Deal Bucks, and other ineligible purchases). If you have them, they're automatically applied to your next eligible LivingSocial purchase." There is another way to earn more deal bucks. Invite your friends via tweets or email to join LivingSocial. and purchase a deal. If enough of them purchase the deal, then you get your deal for free! They also have an affiliate program with your referral link you can earn money with sign ups and purchases. You can choose which town you would like to receive deals from by receiving emails or by downloading their app for your IPhone or your Android. And instead of printing your deal, you can just show the merchant your voucher on your IPhone or Droid. If you enjoyed this post, consider using my referral link to sign up for LivingSocial and purchase a deal.